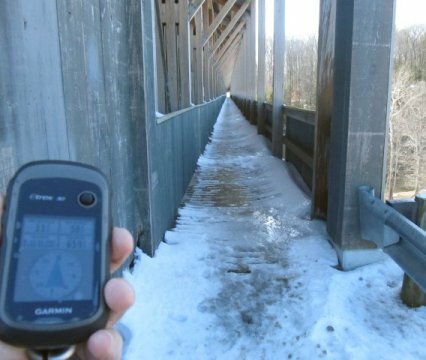 The county's 17th publicly accessible covered bridge cost approximately $7.78 million to build, and features walkways along both sides. It is constructed of four 152 feet (46 m) sections that rest on concrete abutments and three concrete piers, and rises more than 93 feet (28 m) over the river, carrying two lanes of legal-weight traffic. The bridge consists of 3-foot (0.91 m) -thick pieces of Douglas fir or yellow pine, with hemlock or yellow poplar being used for the siding. The builder was Union Industrial Contractors and Koski Construction. The bridge is located 1.6 miles (2.6 km) east-southeast of Ashtabula, at the same location as the previous bridge which carried State Road across the Ashtabula River. The old bridge, a steel bridge built in 1949 (National Bridge Inventory number 0430714), replaced the Crooked Gulf covered bridge (number 35-04-01) built in 1867. The bridge was dedicated the afternoon August 26, 2008, where the name was unveiled. 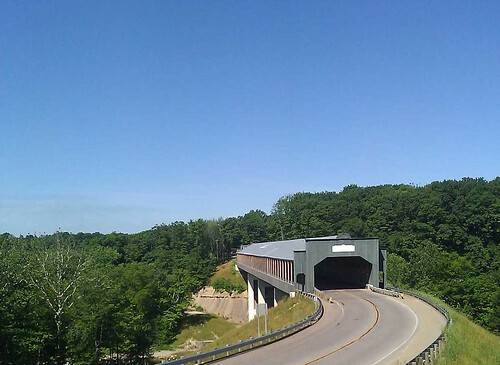 (The county already has a State Road Covered Bridge located along a different "State Road" (C-354) over Conneaut Creek in Monroe Township, which is the reason for the name chosen for this bridge.) The bridge was opened to traffic, following the construction of connections to the existing State Road, the evening of October 7, 2008. A visitors' pavilion was added to the site in 2010. Rnfg fvqr bs oevqtr, abegu fvqrjnyx. Whfg cnfg gur 3eq iregvpny fhccbeg ornz, haqrearngu gur ubevmbagny ornz. We had just finished Mr Yuck's other nearby bridge cache and couldn't resist coming over to get this one as well. Ice and snow required a bit of careful walking, but everything worked out for a fast find. The park down below was closed, so we may come back sometime to check out the view from below. This is yet another great spot that we found solely because of our hobby. Many thanks for bringing us here! Found this one with Falamazar. Actually our first OpenCaching find. This is one of our favorite places locally so what better place to make our first find than here? We have been geocachers since October of 2010 now and thought it might be fun to add a little something more to out out door hobby by making finds on a few OpenCaching caches while we're at it. Looking forward to making our next find soon. Thank you Mr.Yuck for hiding this and the fun we had in finding it. My wife and I first found geocaching in the fall of 2010. We quickly fell in love with the hobby. Over the last 5 years, we have made over 6000 finds on the other guys website, and now find ourselves needing to go further and further from home just to get a smiley. We were aware of Garmin's opencaching.com site, but that site has now gone by the way side. So we turned our attention to opencaching.us. We were glad to see that there were a few opencaching caches in our area, and since this one was close to home, and at one of our favorite scenic locations, we decided to give it a shot. We quickly located the BIT tag, but when we went to log the find, the system rejected the password we had from the tag. I messaged the cache owner, and he quickly addressed the situation and emailed me back. Thank you Mr. Yuck for the timely response to the issue. With the problem now corrected, we can gladly clain the FTF honors for this cache. Hard to beoeve that this one has been here for 2 years without a logged find. Thanks for the cache, and the smiley.